Expressed in platelets, erythrocyte membranes, lymphocytes, spleen, thymus, prostate, testis, uterus, intestine, colon, heart, placenta, lung, liver, kidney and pancreas. Not detected in brain and skeletal muscle. 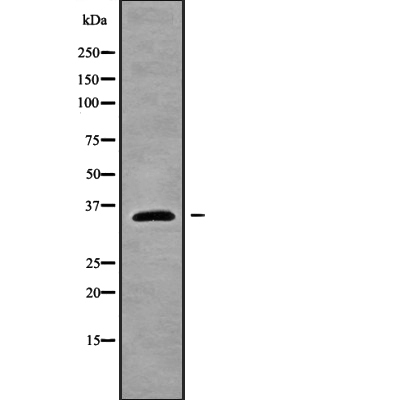 Small volumes of anti-PLSCR1 antibody vial(s) may occasionally become entrapped in the seal of the product vial during shipment and storage. If necessary, briefly centrifuge the vial on a tabletop centrifuge to dislodge any liquid in the container`s cap. Certain products may require to ship with dry ice and additional dry ice fee may apply. Function: May mediate accelerated ATP-independent bidirectional transbilayer migration of phospholipids upon binding calcium ions that results in a loss of phospholipid asymmetry in the plasma membrane. May play a central role in the initiation of fibrin clot formation, in the activation of mast cells and in the recognition of apoptotic and injured cells by the reticuloendothelial system. Subunit Structure: Interacts with ABL. Similarity: The N-terminal proline-rich domain (PRD) is required for phospholipid scramblase activity. Belongs to the phospholipid scramblase family. NCBI/Uniprot data below describe general gene information for PLSCR1. It may not necessarily be applicable to this product. May mediate accelerated ATP-independent bidirectional transbilayer migration of phospholipids upon binding calcium ions that results in a loss of phospholipid asymmetry in the plasma membrane. May play a central role in the initiation of fibrin clot formation, in the activation of mast cells and in the recognition of apoptotic and injured cells by the reticuloendothelial system. 1. Inhibition of PLSCR1 decreased the antiviral activity of IFN against HBV.